Undaunted by Japan’s national consensus to boost the economy, which has been mired in lackluster growth for decades, environmentalists are taking baby steps towards incorporating climate change into national legislation. Proponents of the plan to make Japan more environmentally friendly are up against Prime Minister Shinzo Abe’s popular ‘Abenomics’ regime that promises to accelerate the country’s two-percent GDP growth through a combination of fiscal stimulus packages and structural reforms. Crippled by the catastrophe at the Fukushima Daiichi power plant in 2011, Japan has seen an increase in fuel imports to make up for the deficit of nuclear power, which once supplied 30 percent of the country’s energy needs. The world’s third largest economy, with a gross domestic product (GDP) of 5.93 trillion dollars, Japan now imports 90 percent of its energy, an arrangement that has left it with a deficit of 10.5 billion dollars. It has also resulted in a sharp spike in carbon emissions – by 2012 the country had recorded an emissions rate of 2.46 tons per unit of GDP, compared to 2.3 tons in 2010. Japan now ranks among the world’s ‘top 12’ emitters of greenhouse gases. Against this backdrop, environmentalists have watched with dismay as the Abe administration has backed away from the previous government’s promise to reduce the nation’s greenhouse gas emissions by 25 percent below 1990 levels by 2020. Now, with their eyes on the upcoming GLOBE Summit of World Legislators scheduled to take place in Mexico City from Jun. 6-8 with the aim of formulating an international agreement on climate legislation, Japanese environmentalists and lawmakers are struggling to revive old promises. The Global Legislators Organisation for a Balanced Environment, or GLOBE, was founded in 1989 with the express goal of leveraging national legislation in response to urgent environmental challenges. Now linked to the legislators’ protocol adopted at the Rio Earth Summit in 2012, GLOBE prioritises lawmakers’ role in shaping a nation’s budgetary allocations to account for increasing natural disasters as a result of global warming, and to prevent the destruction of natural environments that has long been justified as necessary for economic growth. One of the organisation’s projects that resonates particularly in Japan is the Globe Natural Capital Initiative (GNCI), which is based on the cold reality that the unsustainable use of natural resources does not, in the long run, accelerate a country’s GDP; in fact, it can actually make a country poorer. Environmental accounting considers the impact of economic activity on a country’s natural resources and calculates all related costs of development including, for example, the bill for cleaning up a contaminated site, waste management expenses, or environmental fines and penalties. Ueda assists GLOBE Japan Head Yoriko Kawaguchi, a former foreign and environment minister known for her insistence on calculating the economic benefit of ecosystems. Kawaguchi, now a member of the House of Councilors – the upper house of Japan’s National Diet – has launched study sessions for parliamentarians to deepen their understanding of the country’s natural capital, and gain their support for the GNCI. “The first step to including environmental accounting in mainstream policy is to convince Japanese politicians through study programmes. They need to realise that economic growth can only be sustainable by calculating the contribution of natural resources,” Ueda asserted. A case in point is the Aichi Fisheries Research Institute (AFRI), which, under the leadership of Dr. Mitsuyasu Waku, is carrying out a multi-million-yen project to restore the tidal flatlands in Mikawa Bay, located in central Japan’s Aichi Prefecture. Coastal wetlands formed from mud deposits, tidal flats are essential ecosystems, providing fertile breeding ground for hundreds of species and preventing coastal erosion. 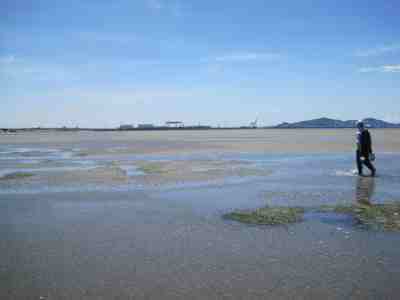 The tidal flats in Mikawa Bay are considered one of Japan’s most fertile fishing grounds, supporting a diverse array of marine species as well as the local economy. Despite their documented benefits at the local and national levels, the tidal flats are an endangered ecosystem in Japan where, in the 1970s, 1,200 hectares of the rich land in the eastern part of Milkawa Bay was cleared in preparation for the construction of a harbour. The result was a significant increase in ‘red tides’, also known as algal blooms – unusually high concentrations of aquatic microorganisms that can release natural toxins that are fatal to marine and coastal species. Red tides have long been associated with the high mortality rates of manatees, and can devastate fishing yields. Speaking to IPS, Waku explained that the restoration and preservation of Mikawa Bay – famous for its massive catches of short-necked clams that provide a livelihood for thousands of fisher folk – strengthens the economic argument for protecting natural capital. Clam catches in Aichi total roughly 20,000 tons annually, representing profits of some 39 million dollars for the local fishing industry every year. “The economic benefits alone of maintaining tidal flats, not even including their natural water purification contribution, is pretty obvious,” Waku told IPS. Other GLOBE proponents, such as Akiri Omori, a macro economist at Yokohama City University, believe that the key to implementing environmental accounting lies in highlighting the economic benefits of such legislature. In an interview with IPS, he explained the challenge of changing the deeply-entrenched notion that protecting natural resources could undermine the nation’s per-capital GDP, a long-held belief that has put out roots during the reign of Abenomics. Omori is currently developing robust indicators – such as calculating the economic benefits stemming from the sale of environmentally sustainable goods – that make a strong case for preserving natural capital. An excellent example of this is the popular organic farming movement in Toyooka City in western Japan that is encouraging collaborative projects between food producers and local financial institutions. Hirotaka Wakamori, head of the promotion section at an organisation called Eco Valley, told IPS that the number of eco businesses in Toyooka doubled to 41 in the last year, the result of a 2005 regulation passed by city councilors. Termed the Environment Economic Strategy, the regulation allows the city to allocate up to 300 million dollars annually to support ventures between local companies and farmers. Organic farming constitutes a major breakthrough in Japan, which is second only to Israel in terms of the quantity of pesticides applied each year to agricultural land, totaling roughly 1.55 tons for every 247 acres. [ https://dspace.lib.cranfield.ac.uk/bitstream/1826/3913/1/Estimation_of_the_greenhouse_gas_emissions_from_agricultural_pesticide_manufacture_and_use-2009.pdf ]Studies have shown that the manufacture and use of pesticides contribute about three percent of the 100-year global warming potential (GWP) from crops. A movement towards organic food production, experts say, is just one of the many initiatives that require the support of strong national legislation in Japan. Already, Japan has embarked on meticulous research that can be deployed to motivate its political leaders.